Concrete Countertop Sealer - How to choose the best sealer for your countertop. 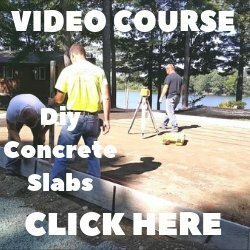 What is the best concrete countertop sealer? 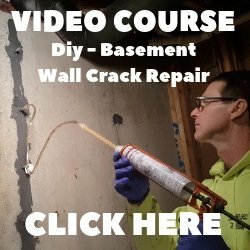 Do I need to seal my concrete countertop? Two great questions, first lets' take a look at why sealing a concrete countertop is important and why choosing the proper sealer is even more critical when it comes to maintaining them. 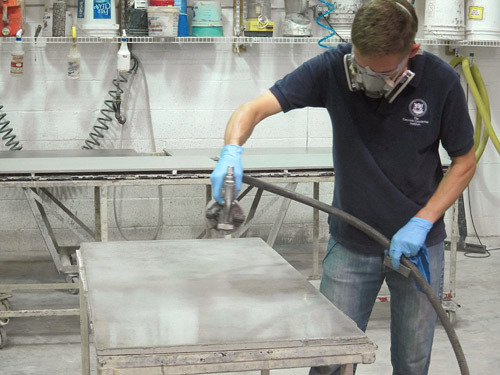 Jeff Girard applies a water-based urethane sealer with a HVLP spray gun. Photo courtesy of The Concrete Countertop Institute. Unsealed concrete is porous which makes it prone to staining and chemical attack. Liquids will tend to soak into the surface, carrying stains into the concrete. Acidic substances like vinegar and lemon juice will dissolve the cement paste, etching the surface. For concrete to be a practical countertop material, it must be sealed to protect it from stains and etching. The best concrete countertop sealer must satisfy these basic items. As with most things the ideal sealer for concrete countertops doesn't exist. So you must weigh the advantages and disadvantages of each type of sealer and choose the one that's best for you. Concrete countertop sealers can be separated into two basic groups: penetrating sealers and topical sealers. One consideration when choosing between penetrating and topical sealers is that sealing concrete that has been polished with a diamond grit finer than #200 can be difficult. The surface is too smooth for many film forming (topical) sealers to stick to. For best results when using a "sealer" on your countertop, don't polish to more than a 200 grit finish. When concrete countertops are polished to 400 grit and higher, only penetrating sealers, densifiers and wax can be used. PENETRATING SEALERS - These work by reacting with the concrete to decrease its porosity and increase the surface density. They are applied to the bare concrete, soak in, and after wiped off and dried, are usually invisible. They don't usually affect the appearance of the concrete, but may leave it looking slightly darker. Wax is used over penetrating sealers to protect the countertop surface as staining may still occur if the spilled substance is not wiped up immediately. ACRYLICS - Acrylic countertop sealers are topical, film forming, and are brushed, sprayed or rolled on. Acrylic sealers offers fairly good stain protection but are easily scratched. They require more frequent reapplication because they tend to wear off. Solvent based acrylic sealers are simple to touch up because the sealer will melt into itself. These come in a high gloss or a matte finish. Acrylics offer modest heat protection but are UV resistant. EPOXIES - Epoxy countertop sealers are a two component system that chemically reacts when mixed. The end result is a very durable, very hard surface. There are three basic types of epoxies: solvent based, water based, and 100% solids. Epoxy that is 100% solids means there is no solvent or thinner in the epoxy, all of the material that is mixed together reacts and forms a coating. Epoxy provides good stain resistance, is very glossy and builds to a thick film. Epoxies tend to be heat sensitive and do scratch easily. The application of epoxy sealers can be tricky, they are sensitive to moisture and can bubble if applied to even slightly wet concrete. URETHANES - Urethane countertop sealers are very tough and durable. They are very stain and heat resistant, provide excellent UV resistance, are scratch resistant and come very glossy or in a matte finish. Urethanes are very sensitive to the surface they are applied to. Many require a primer, which is often epoxy. Because of this they tend to look like a thick plastic coat. There are versions of urethane sealers that can be applied to bare concrete if the surface is prepared properly. They must be measured out precisely and mixed thoroughly. If not, they could peel and are difficult to repair. POLYASPARTICS - Polyaspartic sealers are very tough, durable and extremely hard. They are heat resistant, stain resistant and UV resistant. They are a two component system that chemically reacts when mixed. They dry very fast, which could make them difficult to apply for a do it your-selfer. For overall protection, a polyaspartic concrete countertop sealer is the way to go. I use Spartic-All RM Clear from Elite crete systems. For ease of installation an acrylic countertop sealer is the best choice. As you can see, there is no best concrete countertop sealer. You have to decide which sealer will work best for your countertop. Update for 2015: Here's my recommendation for the best sealer for concrete countertops.